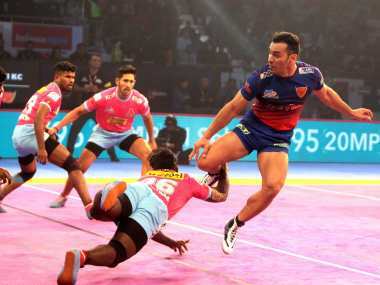 Panchkula: Dabang Delhi played out a thrilling 37-37 tie against Jaipur Pink Panthers in a Pro Kabaddi League season 6 fixture at the Tau Devi Lal Stadium in Panchkula on Thursday. Selvamani's four-point raid was the brave moment of the match, while Sandeep Dhull showed immense strength and high fitness levels to score 6 tackle points. 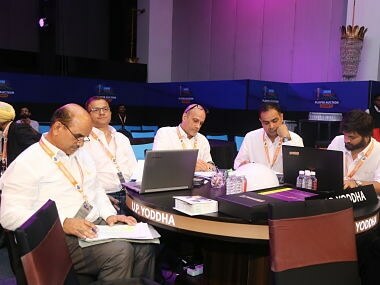 Deepak Hooda scored 8 points for Jaipur, while Chandran Ranjit (11 points) and Pawan Kadian (9 points) were among the top scorers for Dabang Delhi. Dabang Delhi made a strong start and led 5-0 after four minutes as they picked up a couple of raid and tackle points. A super tackle in the 5th minute opened Pink Panthers' account. They were kept alive in the match because of their defence as they forced another super tackle in the 8th minute to level the match at 6-6. Dabang Delhi took the lead once again, inflicting an all out in the 11th minute to lead 11-7. Selvamani's super raid in the 13th minute got Jaipur back in the match once again. It was a see-saw of a match with Jaipur cutting the deficit every time Delhi threatened to run away with the match. 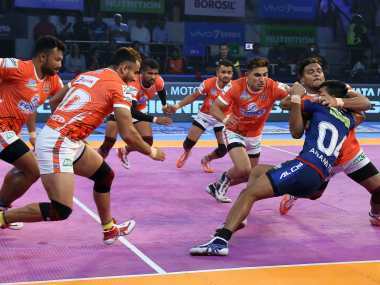 Ajinkya Pawar's two-point raid in the 17th minute made it a one point gap as at the end of the first half Dabang Delhi led 18-17. Pawan Kadian made a super raid in the 21st minute to give Delhi 21-18 lead. But Selvamani's brilliant four-point raid in the 24th minute got Jaipur back in the match once again. With less than five minutes to go Jaipur were trailing by five points when Ajinkya made a two-point raid to reduce the gap to three.